Fresh crab meat adds a touch of luxury to this easy Welsh favourite. Heat a griddle pan. Drizzle the sliced sourdough with olive oil and place on the hot griddle. Cook on each side for 2-3 minutes, or until the bar marks appear. Place the cheese and beer in a frying pan and heat gently until the cheese is melted, and the sauce is bubbling and smooth. Stir in the mustard, Tabasco and Worcestershire sauce. Add the white and brown crab meats, flour and egg yolk. Cook until just thickened then season, to taste, with salt and black pepper. Finish with the chopped chives. Spread the mixture on the griddled sourdough and place under a hot grill for 1-2 minutes or until golden-brown and bubbling. For the green salad and French dressing, put the salad leaves in a large bowl. 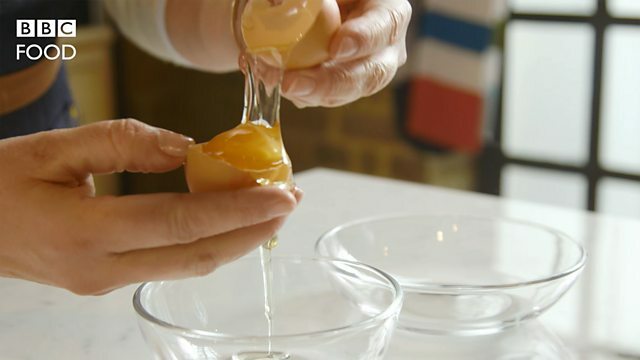 In a small bowl or jug whisk the egg yolk, vinegar and mustard together. Gradually add the oil in a thin steady stream whisking all the time until all the oil is incorporated. Add the chopped shallots. Just before serving pour the dressing over the leaves and mix. To serve, place the crab rarebit on a serving board with the green salad alongside.